In 11 departments (French equivalent of counties) across the Southern half of France, 21 people were picked up in a large-scale operation by the Gendarmerie yesterday morning. According to sources close to the enquiry, they were targeting a new wave of horse-meat trafficking; produce that was allegedly re-sold to consumers having first being used in the pharmaceutical industry – in particular at the worlds fourth-largest pharmaceutical company (in terms of prescription sales) Sanofi. About 200 horses used by Sanofi used in the production of serums had seemingly found their way into the human food chain through the falsification of veterinary documentation. One Sanofi site in the Ardèche is said to have transferred them between 2010 and 2012 to a horse dealer in the Gard who, in turn, sold them to an agent in Narbonne who is suspected of having organised the illegal trafficking. 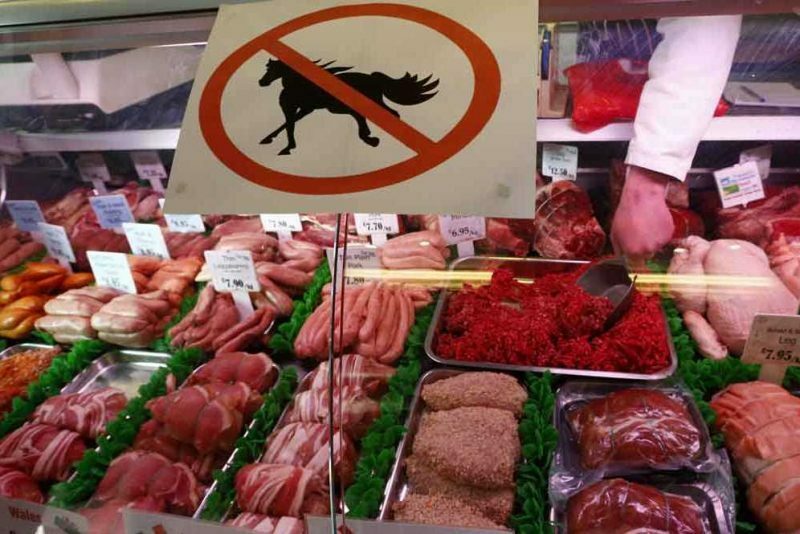 On a lesser scale, there was also illegal trafficking of horse meat involving meat purchased at equestrian centres and from individuals. The system is said to extend beyond France’s borders as far as Girona in Spain, where an abattoir was raided by law and order forces. According to Guillaume Garot in the Ministry of Agri-food in Paris, it’s impossible to say “at this point” whether or not the illicit horse meat trafficking has endangered the health of any consumers. However, according to a source close the enquiry, “this affair is potentially more detrimental to health” than the Spanghero affair from earlier this year that followed the Irish discovery of horse meat in the European beef trade. This current enquiry has nor direct relation. For its part, Sanofi has indicated that it has fully collaborated with the enquiry and had been helping authorities with their investigations for some time. None of the Sanofi employees are said to be among those arrested and the aim of yesterday’s dawn raid was to try and establish where and when the falsified documents were made. Among those arrested are the agent from Narbonne and one of his close associates, several other meat traders, veterinarians and an IT consultant from the Alpes-de-Haut-Provence department. The entire operation involved about 100 Gendarmes in the departments of Aude, Gard,Hérault, Alpes-de-Haute-Provence, Cantal, Haute-Loire and the Puy-de-Dôme, Drôme and Tarn-et-Garonne. In Narbonne, Gendarmes swooped on the home of the agent in question where they arrested him and brought him to the town abattoir. There, they proceeded to search the building and took away documentation. They then seized meat samples from a butcher’s shop in Narbonne, which they took away in a refrigerated lorry. The enquiry that led to yesterday’s action was sparked by an anonymous tip-off at the end of 2012 and is, according to the French Ministry of Consumers, the result of months of surveillance work in the wake of the other horse-meat scandal that broke earlier this year. The ministry also pointed out that France is to become the first country in Europe to have obligatory labelling of source meat in prepared meals. Sanofi confirmed that it sold about 200 horses in the last three years, mostly to veterinary schools, as well as to private individuals and professionals. The animals were not used for laboratory tests but for the manufacture of medicines – purified equine serums, used as antidotes against rabies, tetanus and venom. They are all electronically tagged and marked “not for use in the human food chain” as a precautionary measure and in principle at least, present no danger for use as consumption.